Last week I mentioned that I'm coming around to the idea that games are fun and that they are enjoyable thing to play with my kids. Up to this point, Daddy has been Chief Game Player in the home but I'm making an effort. Thanks in part to Winning Moves Games, I've been provided with an opportunity to introduce my kids to the types of (simpler) games that I enjoyed playing as I was growing up. This week we played Sorry Classic Edition Board Game . Sorry is designed for ages 6 and up but there's no way my 4 year old is going to sit quietly by on the sidelines so we taught him to play it as well. He had a few difficulties in learning to count out the squares and the cards had to be read to him at first. Within a game or two he had picked up the rules and memorized the card instructions well enough to play without a lot of prompting. It should be noted that there is very little reading required to play this game. Number recognition is the big requirement as is playing with someone old enough to read the cards. For example, the number 4 card directs you to move back 4 squares instead of forward. You won't know this unless you can read the card. When I play with my 4 and 6 year old it takes roughly 30 minutes to play a game from start to finish. As an interesting historical note, the game of Sorry! as we know it was first designed and played in England. It was trade-marked by William Henry Storey in 1929. The British manufacturer of the game sold it in in 1934 and that same year Parker Brothers picked it up. The history buff in me also compels me to tell you what world events were happening when this game was first introduced. - The St. Valentine's Massacre occurred. - The Vatican City gained its independence from Italy. - The first Academy Awards were hosted in Los Angeles. - The Geneva Convention was held in Switzerland, discussing the treatment of POWs in WWI. And, of course, there was also that great Wall Street Crash which turned the United States upside down. Thanks to Winning Moves for providing a copy of Sorry Classic Edition to my family in exchange for our honest thoughts. We honestly found it to be very enjoyable! Sorry is my mom's favorite game, so we played it quite a bit. Sorry was actually one of my least favorite games. :-) When the kids were younger they had a really hard time about getting upset when they were sent back to start. Over time they've all come to enjoy strategy games more than games of chance, though those are a little harder to come by for very young kids, and I can see the learning value for young ones in this. I'm trying to think what we played when the kids were little. We did play Sorry and Candy Land. I think there was something called Hi Ho Cherry-O, mostly a counting game. There were different versions of a Memory or Concentration game (a bunch of cards turned face down and you had to turn over two at a time trying to find a match - if you didn't you had to turn those back down and then turn more over on your next turn, trying to remember where the other cards were that you turned over before). I think we started Uno with them fairly young, though that's mostly chance as well, but it's good for learning colors and numbers. When they got a little older they liked Payday and Dutch Blitz. Sorry was a big hit around here when Kyle was younger as well. He still likes it, but I just appreciated a game that entertained me, but that he could play as a young-un as well. 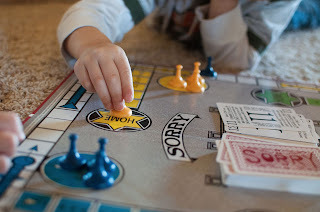 Sorry is one of the few games my family played when we were younger. My daddy even built our game. :) I think he even built a newer version for the older grand-kids. We loved it, though! I don't like Chutes and Ladders. It is too hard to keep track of which direction to go...as an adult. I can see it now, some game maker has just created this game and he's sitting there wondering what to name it, then all that bad stuff happens. Perfect! Are you stalking my childhood or what?! 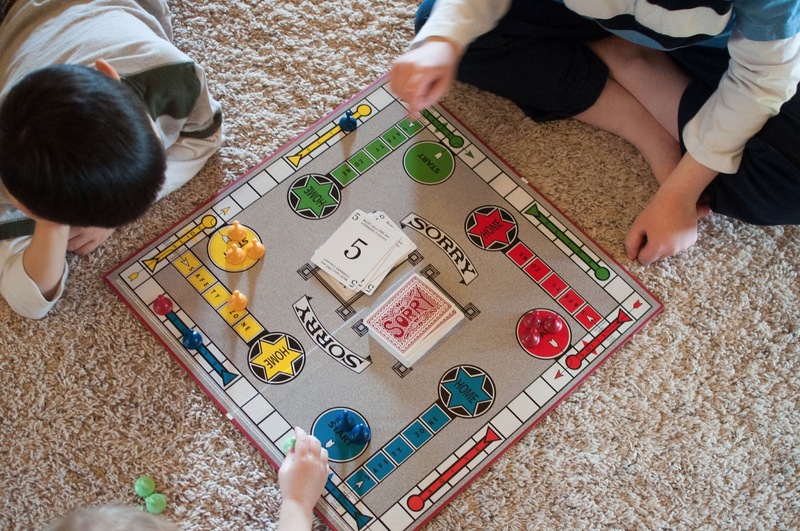 I'd hate to venture a guess at how many games of Sorry I played growing up. . .